In Bermuda, you’ll fall in love…with our magical natural beauty, distinctive colonial architecture, and vibrant island life. Get ready to grab your wheels, and go. The question for visitors to Bermuda is not what to see, but what could they possibly afford to miss? For this is an island steeped in culture and heritage. Treasures lie round every corner; the deeper you delve, the more you discover. The only way to take it all in is to grab yourself a scooter and go explore. As an independent traveller you’ll see Bermuda as the Bermudians see it. We know that the quickest way to get anywhere is by scooter. And we know that the best of the island is usually just round the corner out of reach of the tour bus. Be sure to check out St George’s, a UNESCO World Heritage Site, the town where time stood still. The narrow streets hark back to the great days of sail and discovery. To experience the might of the British Empire, head west to see the fortifications of the Royal Naval Dockyard. Just press the start button on your scooter and let your adventures begin. Click the (+) sign to see what Bermuda has to offer.. If you love architecture and history, then the City of Hamilton’s Heritage walk will be right up your street – if you’ll pardon the pun. Located in the north east of St. David’s Island in Bermuda lies St. David’s Battery, a strategic military battery built for the defence of Bermuda. See Alexandra Battery in Bermuda by Moped! There are several historical forts to see in Bermuda and one of them that you should visit is Alexandra Battery. Situated at the north east edge of Bermuda in St. George’s Parish, Alexandra Battery and Fort was first built around 1860. When in Hamilton, you may well see policemen posing for tourists’ photographs at a lovely looking human-sized birdcage located at the junction of Front Street and Queen Street. The town of St. George’s is one of the biggest attractions for tourists in Bermuda, especially because it is a Unesco World Heritage site and because it was the first town built on the island by the colonists in 1612. Religion plays an important part in the past and present history of Bermuda. Amongst the religions practised on the island, is the Anglican church with a dozen of churches built in Bermuda. There are many places to visit while in Bermuda, and the variety of subjects means that there is something for everyone and every taste. But even if you are not a fervent historian, the Featherbed Alley Printery, in St. George should definitely be in your list of visits not to be missed. When you visit Bermuda, take the time to walk about and discover the landscapes and the sites that are part of the island’s history like the Whale Bay Battery, in Southampton. Bermuda is a very religious island, especially due to its history and since the times of the slavery. There are literally churches that can be seen at many road junctions, the majority of them old and great examples of the different architectural styles that can be found on the island. There could be only one way for Bermuda to celebrate the approach to Christmas and that is, of course, on water! Camden House, the official residence of Bermuda’s Premier, is an 18th century Georgian building situated in the centre of the Bermuda Botanical Gardens. King’s Square is at the heart of the historic town of St. George, the place where Bermuda’s history started and where the men of Sir George Somers first landed on the Island after their ship Sea Venture crashed on the reefs in 1609. Bermuda has two lighthouses, Gibb’s Hill Lighthouse on the south-west and St. David’s Lighthouse on the north-east. Religion has played an important part in Bermuda’s history and there are many churches on the Island to remind you of it. The magnificent St. Peter’s Church is found in the parish of in St. George’s in Bermuda. It has the distinction of being the longest standing Anglican church in existence out with the UK. Bermuda is a heaven not only for tourists but also fauna and flora. If you like nature and want to see the wild side of the island, stop by the Spittal Pond Nature Reserve, the largest nature reserve in Bermuda with a territory of 64 acres. The Black Watch Pass & Well is a road and pathway built in the parish of Pembroke in Bermuda. It was built to link North Shore Road to the capital city; Hamilton in 1934. There is a historical site in Bermuda which attracts a large number of visitors each year. It is the classical building called the old State House. It is also referred to as The Old Session House. It is situated on Princess Street, in the town of St George, in St George’s Parish. St Theresa’s Cathedral is a Roman Catholic Church; first constructed in 1932. It was erected on Elliott Street (At Cedar Avenue) in the city of Hamilton in Bermuda. A large number of people take a trip to The Cabinet Building and Senate Chambers in Bermuda .They are located in Front Street in Hamilton. One of the most interesting places to visit in Bermuda is the Session House. This is the site of the House of Assembly. It is located in appropriately enough Parliament Street, in Hamilton. Are you interested in witnessing Bermuda’s past up close? Then take in a full size rendering of a historical ship, dating back to the 1600s; called Deliverance. Albuoy’s Point is a popular destination for tourists visiting Bermuda. It is the site of the Point Pleasant Park. The Old Rectory is one of the longest standing structures in St George. The property was a private home; built by a former slave trader and pirate named George Dew. It can be traced back to before 1700. The Perot’s Post Office is a place of great historical significance and a great place to stop off on your moped. Another popular historical site in Bermuda, serving monuments to its military past, is the striking Scaur Hill Fort & Park. Visit the spiritual site in Bermuda folk make a pilgrimage to every year; tourists and residents alike. It is the universally admired Bermuda Cathedral. The magnificent Mother Anglican church is also known as The Cathedral of the Most Holy Trinity. Blue Hole Park is a spectacular nature reserve in Bermuda. The highest point on the island is not a hilltop – even though Bermuda is a volcanic sea mountain – but a lighthouse! Would you like to witness history first hand? How about walking around an old British army base which has been turned into a tourist attraction? The St Andrews Presbyterian Church in Bermuda is an awe inspiring house of worship in Bermuda. There is nothing like a good book. And there is a world of literature waiting for you at the breathtaking Bermuda Library in the capital city of Hamilton. Do you wish to more about Bermuda’s history? Then take a trip to King Street in St George’s Town. This is where you will find Bermuda National Trust Museum. Where you come face to face with the island’s past! 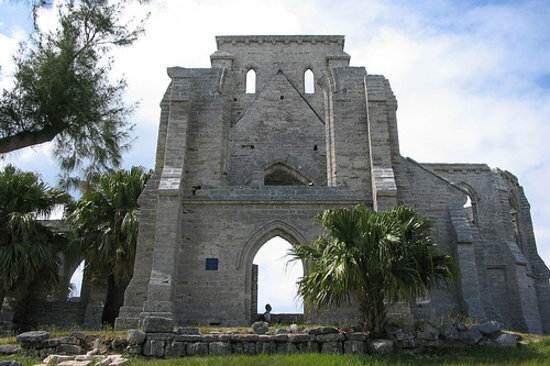 One of the most visited religious landmarks in Bermuda is the famous Unfinished Cathedral in Bermuda St. George’s. This inspiring point of interest is found at Blockade Alley in the stunning Somers Garden, at North Gate. It might have only be discovered in the early years of the 17th century, but Bermuda arose from the Mid Atlantic Ridge about 100 million years ago! When thinking of Bermuda, the wonderful and unique beaches and sunshine are obviously the first thing that comes to mind, but there is much more to see! Southampton is one of Bermuda’s nine parishes and was named after the third Earl of Southampton, Henry Wriothesley (1573-1624), patron and friend of William Shakespeare. Southampton covers about 2.3 square miles (6 square kilometres or 1,500 acres). Founded in 1790 and named after the Island’s governor, Henry Hamilton (from 1788 to 1794), whose ancestor was Mary Queen of Scots, Hamilton is rich in history and is most certainly a port to consider if you plan a cruise to Bermuda. Ordnance Island Dock,Bermuda, is one of the two commercial ports of St George’s used by cruise and traffic ships. It is on Ordnance Island, which is part of St George’s town and located very close from the shore, right across from the town’s King’s square. Bermuda History and Culture Facts: between military and tourism! A street map of Bermuda to start planning your holidays!